You may remember that back at Joy of Six 2016, I bought a bunch of 2mm houses from Brigade to make up some scenery for Blücher. Well, with the house move and various other issues, I was unable to work on the scenery tile for a while. That was until recently, when I sat down and finished it off. The garden walls and fences were made with trimmed down coffee stirrers, found in any fast-food restaurant. I added flock as trees and shrubbery to help break up the buildings and am quite pleased with the outcome of this first urban tile. 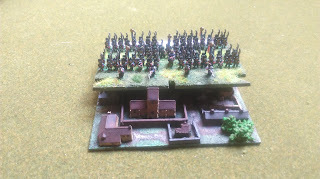 Here they are next to a brigade of 6mm French soldiers on Blücher sized bases to give you an idea of the scale. 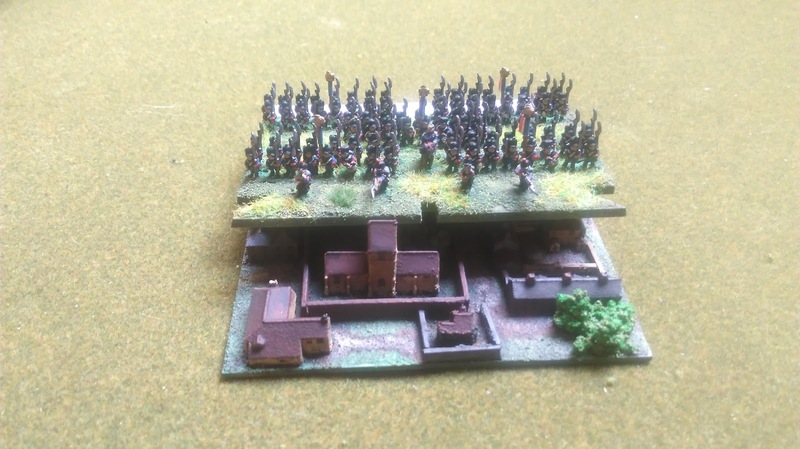 The urban tiles in Blücher are supposed to be slightly bigger then a base width, so this is about three and a half inches square, enough to fit a base comfortably on during a game as a garrison. 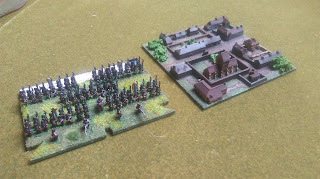 Only one brigade may garrison an urban tile, so this works perfectly for game needs. 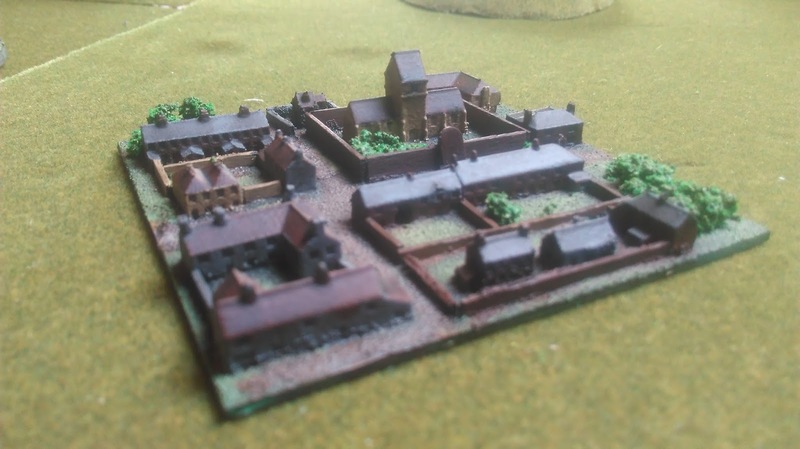 Also, the 2mm size of the houses doesn't jar too much with the 6mm figures, so I will make more of these to be able to make villages, towns and cities for Blücher games. The small size of the houses allows for more realistic looking urban areas rather than the 6mm sized ones I was using previously, which only fitted a couple of houses on the tile and looked crammed. The 6mm ? 2 or 3mm looks very good. Half man half biscuit Back in the DHSS, also very good stuff. Thank you! The figures are 6mm, the buildings are 2mm. Well done Chris, you win a pat on the back! Thanks Robert, your tiles look brilliant and have given me inspiration to do the same! Showing my age I fear. My musical tastes never really got out of the 1980`, with a few exceptions.